Smallholder farmers, who hold over 80 percent of all farms in sub-Saharan Africa, are struggling to adapt to rapidly rising temperature and erratic rains, according to the 2014 Africa Agriculture Status Report (AASR), released on 3 September in Addis Ababa. It says these farmers are now facing the risk of being overwhelmed by the pace and severity of climate change. Farmers are already contending with an increase in average temperatures, with further increases of between 1.5 and 2.5 degrees centigrade expected by 2050. Despite a decade of pro-growth and food security policies and programmes such as the Comprehensive Africa Agricultural Development Programme (CAADP), 200 million Africans are chronically malnourished and 5 million die of hunger annually, says report by AGRA. “As climate change turns up the heat, the continent’s food security and its ability to generate economic growth that benefits poor Africans - most of whom are farmers - depends on our ability to adapt to more stressful conditions,” said Jane Karuku, president of AGRA. During the African Green Revolution Forum (AGRF) in Addis Ababa last week, participants said countries need to adopt technologies and “climate-smart agriculture” that will help make crops more resilient to future extreme weather events. 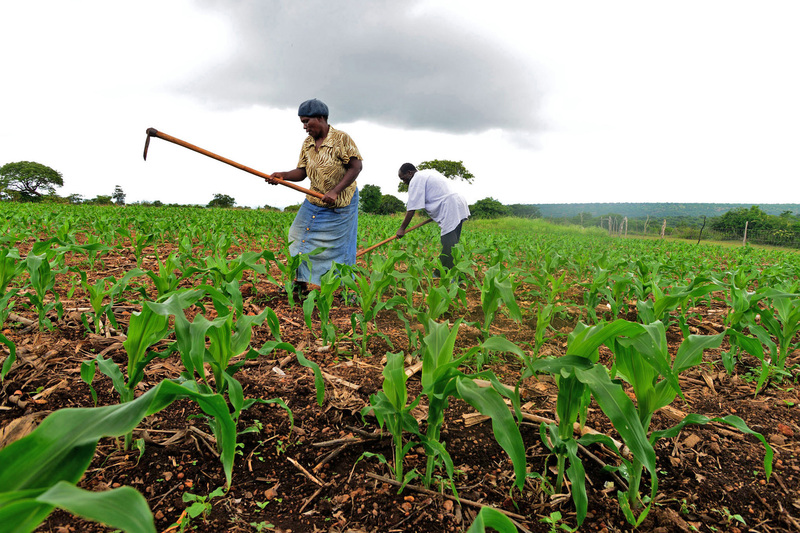 Erratic farming practices (such as the failure to apply mineral or organic fertilizers), and soil erosion, are depriving croplands across sub-Saharan Africa of 30-80kg per hectare of essential plant nutrients like phosphorous and nitrogen. Soil Scientist James Mutegi of the International Plant Nutrition Institute said African countries should not only engage to reverse the current trend of low crop productivity and land degradation, but also forget blanket recommendations regarding fertilizer applications to their soils. Fertilizer promotion programmes in Africa are often unsuccessful because they are designed with a “one-size-fits-all” philosophy - failing to recognize the diversity of production systems and the range of farmers’ needs, according to the World Bank. To keep African soil healthy, Mutegi said farmers “should apply the right fertilizer at the right time, and in the right way at the right time” as the soil types on the continent, or even within a given country, are not the same. “We need to lose the usual blanket recommendations,” he said. Africans, he said, need to map their soil and, in the case of some countries, should update their maps. Mapping would be “crucial” to know exactly where fertilizers should be applied or not. “In cases where there is no deficiency of some nutrients, farmers should not end up losing investments in fertilizers,” he said. Ethiopia’s recent move to map out its soil and build in-country blended fertilizer production facilities near farmers is seen as a good approach for other Africa countries. Ethiopia’s fertilizer initiative to introduce customized fertilizers would greatly increase crop yields, said Mutegi. Fertilizer use in Africa remains low compared to other regions, with average use at around 10kg per hectare, while the global average is over 100kg per hectare. According to Namanga Ngongi, chairman of NGO African Fertilizer Agribusiness Partnership (AFAP), African countries need to work on two areas to improve the current situation. “First [is] to improve the logistics around fertilizer distribution,” said Namanga, adding that about 40 percent of the cost of fertilizer in Africa is due to transport from ports of entry to the farmer. “Secondly, we need to have the farmers improve their financial access to fertilizer,” said the Cameroonian agronomist. Namanga said the private sector’s increasing participation in fertilizer programmes in Malawi, from procurement to transportation of fertilizers to various outlets, was a “courageous effort” to change smallholder farming. A decade ago Malawi introduced a large-scale national programme to subsidize agricultural inputs (mainly fertilizers for maize production), targeting more than 1.5 million farming families. The result was increased maize production and real incomes. The stagnant state of commercial seed production is often cited as a key reason why yields per hectare in Africa for staple crops like maize are up to 80 percent below what farmers outside Africa achieve. According to Associate Director of the Program for Africa’s Seed Systems (PASS) of AGRA, George Bigirwa, more work is needed to improve seed systems in Africa, through encouraging local research institutes and locally-owned African seed companies, and installing mechanisms to reach farmers with the “improved” seeds. After attempting to tweak their seed system, nine African countries have seen positive results in identifying and breeding seeds that are suitable for planting in a particular environment. Conducted by AGRA in 2013, a survey, planting the Seeds of a Green Revolution in Africa, found that most farmers who invested in improved crop varieties achieved yields 50 to 100 percent above local varieties. The same survey indicates that 69 percent of farmers in Kenya, 74 percent in Nigeria, and 79 percent in Mozambique said improved maize varieties had doubled harvests per hectare. The International Food Policy Research Institute (IFPRI) says agriculture contributes one-quarter to one-third of African GDP but employs 65 to 75 percent of the labour force, according to IFPRI. The worrying factor is, according to a new report released last week in Addis Ababa by the Montpellier Panel entitled Small and Growing - Entrepreneurship in African agriculture, African youth see agriculture as an “outdated, unprofitable” profession. The report said more investment is needed in rural and food sector entrepreneurship, particularly among Africa’s growing youth population, for the continent to achieve food security. The sector may seem more appealing, when one considers the amount of money African countries invest in food imports. “When I hear US$35 billion food [imports to Africa annually], as an entrepreneur I say ‘what an opportunity’,” said Strive Masiyiwa, an African telecoms mogul. In the report, the Montpellier Panel, comprising African and European experts, said youth should be informed more about the benefits of this opportunity. They said this can be achieved through vocational and business management training for the youth, adequate and affordable financing for starting and growing enterprises, and by creating enabling environments for entrepreneurship on an individual and collective basis. Female small scale farmers dominate the agricultural landscape in most production environments in sub-Saharan Africa. Yet they constitute the majority of rural actors locked in socio-cultural structures that limit their agricultural productivity, efficiency and effectiveness at all points across the value chain. According to the director of African Women in Agricultural Research and Development (AWARD), Wanjiru Kamau-Rutenberg, the issues of equity should be embedded in all aspects of agricultural production. Only 45 percent of women in Africa are literate, compared to 70 percent of men; about 1.5 percent of women achieve higher education. “By focusing on building the capacity of young people and women in particular, African governments will be able to increase the productivity of a large proportion of their labour forces,” says the Montpellier Panel report. It argues that Africa should encourage initiatives such as AWARD, a career-development programme that equips top women agricultural scientists across sub-Saharan Africa to accelerate agricultural gains by strengthening their research and leadership skills through tailored fellowships. To date, 325 scientists from 11 countries have benefited from the programme. Only 4 percent of African cropland is irrigated, according to AGRA. The rest depends on increasingly erratic rainfall. But water management can mean much more than irrigation. According to AASR 2014, water productivity in African agriculture will be affected by climate change as more active storm systems emerge, especially in the tropics. Greater variability in rainfall is expected, which will increase the risks of dry-land farming. “The demand for irrigation will grow [in terms of area] and irrigation water use on existing crop areas will increase due to greater evaporative demand. The water resources available for irrigation will become more variable, and could decline in areas with low rainfall,” the report says. Total agriculture land increased by some 8 percent in the last decade, while the irrigated areas remained stable, after a steady increase from 2 to 5 million hectares from 1960 to 2000. The authors of AASR said agricultural productivity in sub-Saharan Africa can be greatly increased through integrated watershed management that takes into account the full water budget for an area, as well as its use, output, and cost/benefit ratio. According to AASR, collecting rain in ponds or barrels, and other “rain harvesting” techniques, offers a simple but underused low-technology approach to climate change. The report also said harvesting only 15 percent of the region’s rain would more than meet the water needs of the continent. Rainwater harvesting for underground storage in Ethiopia, for instance, the report says, could be “used for supplemental irrigation of high value crops”. Motorized equipment in Africa contributes only 10 percent of farm energy, said AASR, compared to 50 percent in other regions. Mechanization can improve productivity and nutrient use efficiency, reduce waste and add value to food products. But progress in this area, scientists note, should be based on energy efficient innovations, including the use of alternative energy like solar-powered irrigation pumps, and supported by better training and repair services and by strong farmers’ organizations. Gordon Conway, director of Agriculture for Impact and chair of the Montpellier Panel, said mechanization “isn’t all about great big machines, but small machines that smallholders can use”. He highlighted a small company in Kampala, Uganda, that makes maize hulling machines which are sold or rented to farmers’ associations. “But the point is that they need to be made, and that often requires young workers; they need to be repaired and that creates jobs; and in this case the machines go from farm to farm, which involves yet another service,” he said. Anne Mbaabu, director of AGRA’s Market Access Program, says post-harvest loss is “the most unanswered and ignored challenge” to food insecurity in Africa, with losses exceeding 30 percent of total crop production and representing more than US$4 billion every year. “That does not include fruits and vegetables, the loss of which is very difficult to track,” said the director. According to Mbaabu, simple solutions such as training farmers on post-harvest handling, food management training on appropriate pre-and post-harvest handling operations and improving market access and knowledge of market requirements would significantly reduce losses. She said famers need to have “better access to storage facilities” and access to new technologies to reduce losses, which exceed the total amount of international food aid provided to sub-Saharan countries annually. AGRA’s initiative and training for 5,610 farmers in post-harvest handling through farmer cooperatives has had “positive results” in reducing losses, says an AGRA official.